The official confirmed that a case has been filed against Indian businessman Mulchandani in Dubai for an alleged liquor related offense and bouncing a cheque for an undisclosed amount, which is an offense in the United Arab Emirates. 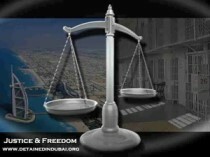 , has been held this week by Dubai police, an official at Dubai’s Public Prosecution told Zawya Dow Jones Tuesday. Jaydeep Anand, Dynasty Zaroonis chief operating officer, was unable to confirm the arrest when called by Zawya Dow Jones. “I have no information,” he said. The Public Prosecution official said that Mulchandani has been questioned but was unable to provide further information. Earlier this year, Dubai’s Real Estate Regulatory Authority cleared Dynasty Zarooni of any wrongdoing after two Indian publications ran reports that some investors had complained that Mulchandani had misled them by showing one property and selling them another. The developer was created in September 2007 with the merger of the Hilal Al Zarooni Group and Dynasty Enterprises Inc and a net equity of 1.35 billion U.A.E. dirhams ($367.5 million).